Mere months after the end of Voyage de la Vie‘s record run, Resorts World Sentosa announced a new show to grace the Festive Grand theatre. Billed as a theatrical magic spectacular, Incanto is truly a spectacle – 90 minutes packed with heart-stopping action, and bewildering illusions. I caught the show last week during the opening weekend. 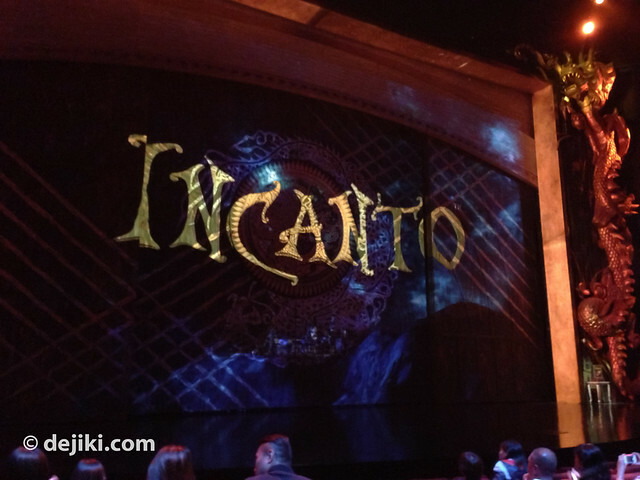 Here is my (hopefully short) review of Incanto. Joe Labero has a perfect mix of charisma and mystique – he executes his illusions with ease and pizzazz. Of course, he appears on stage with a bang. The segments in the first act were very impressive – a few twists on old classics, such as “Sawing a woman in half” (more like several blocks this time), walking through people and escaping from falling spikes. As this is a live show, Labero will also interact with the audience for several tricks, so those who bought tickets along the aisles – you might just get lucky and be picked! The Double Levitation illusion, where Labero and another performer floats off the floor – was a bit confusing (or rather, it just seemed too simple and obvious). Blade Runner was also rather disappointing in my opinion. It was well executed, but this illusion is just common (very similar to David Copperfield’s Laser Illusion). Unlike the acts in Voyage de la Vie, where usually a single performer takes the stage, Incanto has a lot of accompanying dance numbers while some stunts were performed. They are good, which poses a dilemma – what to watch? The stunts? or the dance? The dance company is quite large, with enough dancers to fill the stage. The show certainly spared no expense here. My sister described the story in one sentence: “It’s like Voyage de la Vie, but they just changed the main character to a girl and added magic tricks”. The storyline feels like a rehash of Voyage de la Vie. The protagonist goes on a journey (and explores an abandoned monastery), discovers a new world (of Incanto) and meets interesting characters (Jester, Sorcerer and the Dungeon Keeper). For the audience, entering the world of Incanto was visceral. The curious Seeker (Oon Shu-Ann) walks around the theatre and onto the stage. Then, a scary number of performers fill the theatre, and immense fog starts to seem through the stage onto the audience. This is followed immediately with an almost ceremonial opening – filled with dance and song. The “battle between good and evil” made its own vanishing act somewhere, because the later segments of Incanto basically has the Dungeon Master challenging the Sorcerer to escape from some seemingly “inescapable” traps. There aren’t any of those spells or Wizard’s Duel (think Harry Potter) that was emphasized in the show’s marketing materials. The addition of acrobatic acts and stunts, while definitely entertaining, do not always add on to the overall experience. I’m not sure how some segments are even relevant. Acrobats doing synchronized jumping through spinning hoops? Yes, they are impressive and I applaud the performers for their talents, skills and countless years of dedication to their art, but um… what is going on exactly? Describing the stunts as nail-biting would be an understatement, especially during The Wheel of Death. It was the most impressive stunt I’ve seen so far, but it seemed very dangerous. In Wheel of Death, two pairs of performers spin this wheel, which is actually two sets of wheel joined together and can freely rotate. 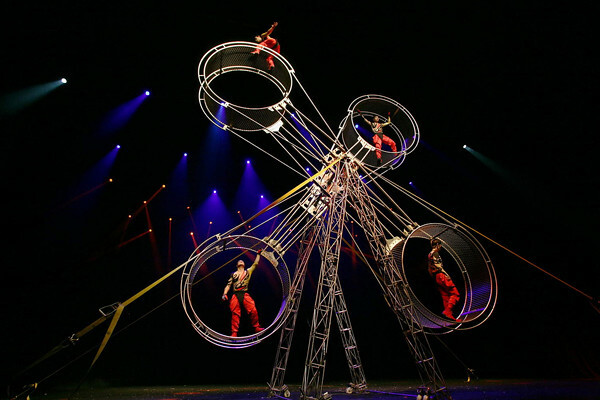 One performer would “run” in the wheel, to create momentum and cause the pair of wheels to spin around the center. The other performer has to maintain his balance outside the wheel by constantly “walking” (like a treadmill) with a precise rhythm. You can see it at the picture above. While the wheels spin like a reduced ferris wheel, the smaller wheels can go as high as 12m. One of the performers (that runs OUTSIDE a spinning wheel) often lost his balance and almost fell off the wheel a few times. Fortunately, he managed to pull himself back up onto the wheel. Before I could heave a sigh of relief, the performer started skipping with a rope on the constantly rotating wheel. Truly death-defying and kept the audience’s heart pumping. Other notable acts include a “chandelier” filled with acrobats hanging off and balancing (with some “jumping” and “throwing”). I was pleasantly surprised that there were no rope/cloth/aerial silk/etc acrobatics in Incanto. There were just too many of these acts in Voyage de la Vie. The physical sets in Incanto look better than la Vie, although some scenes were reused a few times. Festive Grand also has a new proscenium arch, one that is slightly curved. Instead of a grand curtain, Incanto uses a large “wooden” gate that fold away to reveal the stage. There is a dragon emblem (of Asian design) on the gate (not sure what’s the link) but when the gates peel away to show a library with gothic design elements, I’m either confused, or intrigued. The videos that are displayed before the show begins (and during the show) could look better. They don’t quite match up with the detailed stage design. There are a lot of pyrotechnics and fog effects in Incanto, and they are very well used. The fog effect is used frequently (and with A LOT of quantity). While common sense would suggest that sitting as close to the stage as possible is the best option, it might not apply for Incanto. The sheer amount of fog totally obscures the stage at some points. While it might not win awards for its score, the soundtrack is sufficient to provoke emotions and overall feel for the world of Incanto. There was even snippets of Hans Zimmer (Inception film soundtrack). One major (and VERY valid complaint) I cannot hear what the Seeker (played by Oon Shu-Ann) is singing – to the extent that I have to read the Chinese subtitles displayed at the sides of the theatre. I assume she’s singing live, but intentionally or not, the backing track reeks of autotune. The sound system might need some adjustments on the levels – vocals were just drowned out in the mix. Incanto does has its flaws, but these imperfections can be fixed in future shows. As long as you can look past its lackluster storyline and music, it’s 90 minutes of good entertainment, the illusions, stunts and accompanying acts are great. However, I am not really into stunts. Is this cirque de soliel or just ripoff of their type of show?